Dystopian Fiction: What’s the Point? Fahrenheit 451: Are You Happy? Fahrenheit 451: Clarisse — dead or alive? As we have discussed in class, both Fahrenheit 451 and Animal Farm are dystopian novels. What is the point of reading about dystopias? To what extent did Orwell or Bradbury predict the future? Do you see any parallels between either of the books and life in the world today? Answer any one or more of these questions using specific examples to support your ideas. Although we may have begun discussing this in class, we usually run out of time. Pick up where we left off OR add new ideas. Once you have posted your idea using your first name and last initial, read the responses posted by your peers. Reply thoughtfully to at least one other peer. What did you learn from his/her response? Compliment strong points made, ask questions, make connections, and build on the ideas shared. If you disagree, remember to do so thoughtfully and with evidence to back up your opinion. Remember to criticize IDEAS and not people. 8 Responses to Dystopian Fiction: What’s the Point? 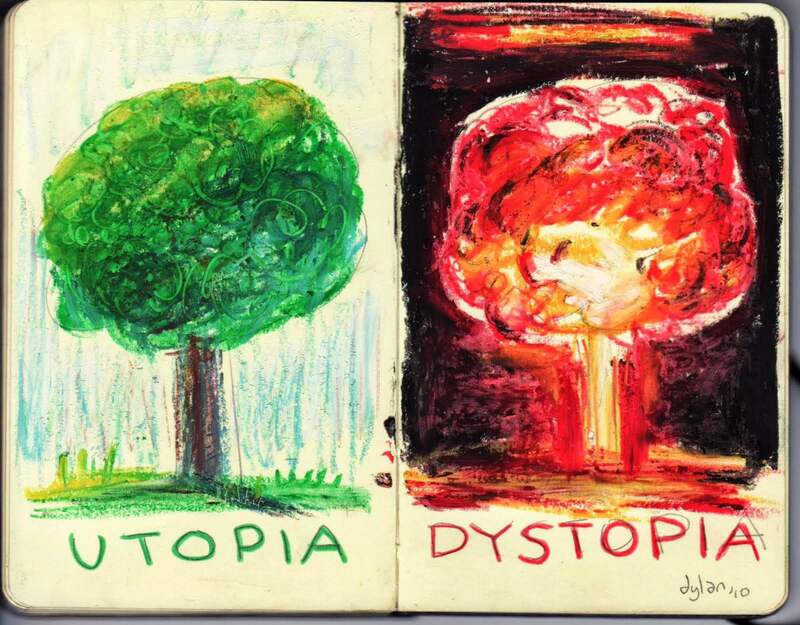 It is good to read about dystopias because we can learn of things not to do, for example Communism in Animal Farm or over-use of technology as well as over-reliance in Fahrenheit 451. Bradbury predicted that humans will have televisions screens the size of walls and books will be outlawed. He was correct to a point, but we do have massive TV screens and there are less physical books and more ebooks, such as kindles. In Animal Farm, Napoleon used a form of Communism in an attempt to run the farm, which lead it into the ground and the animals had no food. This parallels North Korea and communism in the country. In Fahrenheit 451, people have more reliance on technology and are kind of like robots, people wake up, go to work, come home and go to sleep and repeat that every day. This parallels (as I said earlier) real life because people use technology for everything, and yes things happen in life, but it can be repetitive at times. I agree with Connor when he says that dystopian novels teach us not to make the same mistakes as the characters in the novel. Following orders blindly and not being able to think freely can lead to a totalitarian government, like in Animal Farm. However, I disagree with the fact that he said that all people in our society act like robots everyday. Just because many people have a routine that they follow because of their jobs, this doesn’t make them robots. The people that act like robots aren’t useful to society and lack the emotional connection to be successful in life, therefore they can’t hold a stable job. The point in reading dystopian novels is to observe the failed societies in the literature and compare it to the issues we face in the real world. It is interesting to see what authors perceive as threats to society and what exaggerations can become a reality if we are not careful. Technology is a great example from Fahrenheit 451, because Bradbury shows how media can consume our lives the moment we prioritize it over knowledge. Bradbury predicted our future by showing how much technology can impact our lives. It is true that technology has become a big part of everyday life, and that it has many addicting qualities that can cause the loss of brain power. Although books are not against the law in our society, our interest in books and literature has certainly decreased because of movies and T.V shows. There are many parallels in Fahrenheit 451 and society today. The loneliness he described because of the dependence on technology is accurate in today’s world. Because people are so consumed with media and technology, they have lost the ability to socialize and develop real relationships, much like Mildred Montag. Mildred thinks her T.V. family loves her, much like people today think that social media friends or online friends love them. Friendships that are developed online are masked with fakeness and lack a lot of what real relationships need. I agree with Mia’s comments because she explains how people spend so much time on social media that they sometimes lose real connections with people, which is a problem in today’s world as well as Fahrenheit 451’s society. I also agree with her statement that much of the loneliness in today’s society is because of technology because many people have anxiety from all the media in society. I made a similar comment saying how people are so reliant and addicted to technology that much of this can lead to what her comment was saying, about loneliness. By reading dystopian literature, it is easy to see what problems these societies have and how they bring real issues to light, such as technology in Fahrenheit 451. Our society can learn from the dystopias and hopefully never let our society end up as theirs. Reading dystopian literature allows people to be aware of their society and helps them stay in tune with reality. Bradbury partly predicted the future by showing how much technology is involved with our everyday lives. People are always on their cell phones or laptops, just as the characters in the book are always watching television in the parlor. As technology becomes more advanced, people are becoming less interested in books. People today are very reliant on technology, as many use the internet for homework or simply spend hours scrolling through social media. Many people are somewhat addicted to their phones as it is the first thing they touch in the morning and the last thing they touch before bed. This is similar to Farenheit 451 as the citizens of the society do nothing but watch television all day with their “family”. The citizens love their television family more than their own family because they are so consumed in the television shows. I agree with Hayley’s assertion that the parlor families are similar to many lifestyles today and I am disheartened to agree that the first thing we do in the morning is grab our phone, and the last thing is putting it down. – The point of reading dystopias is to highlight the faults in the path society is taking; for example, Bradbury highlighted the negative effects of being dependent on technology, and Animal Farm highlighted the faults in a corrupt society. Dystopias are also meant to act as warnings about future situations that are not ideal. For example both Fahrenheit and Animal Farm depict a situation where individuality has been stripped, and where individuals have no say in what happens in around them. – Orwell and Bradbury accurately predicted some conditions on present society. Bradbury depicted a world in which technology is prevalent in everyone’s lifestyle, and where an internet presence is demanded from almost everyone. Orwell showcased a world with government corruption and a gullible public. This is not unlike the socialistic / communistic set up of countries like China and the USSR. However, I think both author’s didn’t give humanity the benefit of the doubt; as some of the situations today are different from the described/predicted outcomes. For example, the new generations are using technology as an advantage; and the public under corrupt governments of the world are not as blind as the animals at the farm. – Yes, there are parallels in the books and in the world today. For example, in both books propaganda is used as a means of control and a way to keep the public under control. Also, we see propaganda surrounding us from all directions, telling us what to think or believe. We also have a degree of conformism in society, blindly devoting ourselves to a government system, person, or belief. The idea of reading dystonia novels is to inform readers of the issues in society. It shows how badly things can go wrong and how. Dystopian novels can teach readers that there is no such thing as a perfect world and if others try to enforce their idea of a perfect society onto other things could go very wrong. Bradbury predicted in his literature that society would be overruled by technology. many people in this society become disconnected from the real world because of this technology which is exactly what is happening today to a lesser extent. In Fahrenheit 451 Montag becomes upset because everybody is so disconnected from the real world that he has become lonely and depressed and feels that nobody is listening to him which is happening in our world today. People today feel as though they cannot make connections with people outside of technology because of how consumed in it they are.